5th June was celebrated as World Environment Day. Started in 1974 this has been a flagship campaign for raising awareness about environmental issues, global warming, climate change etc. Today this is a global platform with 143 countries participating annually. In today’s time, saving the environment should be the top priority for every country if they wish to exist. 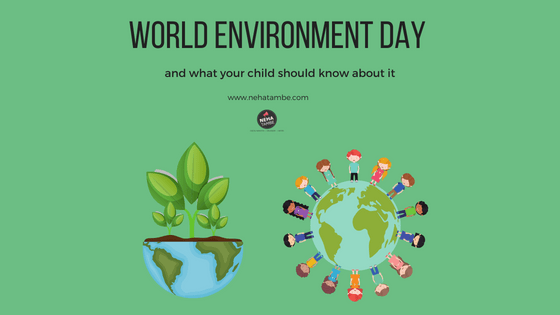 I have listed out a few stories that I came across about people’s initiation and suggestions how we can discuss world environment day with our children. As we traveled around the world and in India we came across some small and big examples of nature conservation. Singapore tops the list as in the one week that we spent there my daughter had some really great, real life learnings about importance of environment and ways to conserve it. The country was originally a marshland, and still need to import most of the things from Malaysia, Thailand and other neighboring countries. It was wonderful to see regular posters everywhere talking about conserving water and other natural resources. 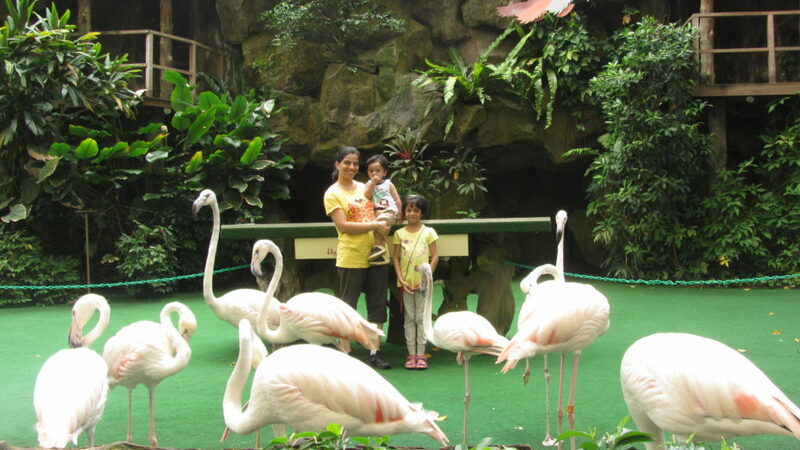 Popular tourist attractions like Jurong bird Park, talk about their efforts in conserving birds. The whole fun way in which the country has incorporated environmental education is commendable. Sirsi is a small town in Karnataka. It comes under the malenadu belt, which means that it receives more than normal rainfall. Malenadu means the rain area. For a town which had never faced any scarcity of water had suddenly been feeling the pinch in the last 4 years. The citizens did not wait for the government or other authority to do something about it. Volunteers came together to clean the lakes and rivers that are around Sirsi area. An effort just over 1 year has yielded amazing results. Today the town is back to its former glory, with clean lakes and rivers with ground water level raising significantly. Volunteers have to continue their effort and also educate the town and tourists who flock there about the importance of conservation. Satara was once the capital of Maharashtra during the Shivaji Maharaja reign. Later post peshwa era, it fell off the map and today it is a big town, in the Western Ghats. Satara was known for its beautiful weather, however in the past few years even they have been experiencing hot summers and dry rainy seasons. Volunteers from the town came together to reforest the Western Ghat. They brought together plants and seeds of all the natural herbs and trees that are available in Western Ghat, and planted them over the last 2 years. Bhutan is still a developing country however the country is seen prioritizing their environment and nature first over development. Regular sign boards about fines for throwing trash in the valley can be seen at every point. The guide with whom we traveled had no qualms over picking up the stray trash and throwing it in the dustbin. It was heartening to see that the country men put their country and its natural beauty on the forefront. Overall as the country practices Buddhism minimalism can be same in every aspect of the life. Such efforts need to be lauded and replicated as otherwise we will also end up being the victims of some shockers that we have heard Around The World. This year cape town became the first city in the world to run out of drinking or potable water. It was declared as the worst crisis to hit the mankind in the current years. It is also assumed that by next year Cape Town will run out of water. This is shocking as Africa enjoys subtropical weather. Maldives is known as the flattest country on earth. Because of its proximity to sea, it is vulnerable to the rising sea levels and there is a fear that majority of the Maldives will be underwater by the end of it this century. They also face a problem of scarcity of fresh water for drinking and other purposes. Climate change is real and the earlier we get serious about it, the better it will be. Antarctica has been losing its ice sheets. Warmer seas would mean more melting and flooding of coastal cities around the world. The higher temperatures on both poles will mean erratic movement of ocean waters thereby causing devastating hurricanes and storms. Arctic is one of the remote locations in the world and yet it is grappling with plastic pollution! Researchers have been studying the traces of this plastic waste that reached the Arctic and fishing and other dumping in the seas or water sources connecting to the oceans are being seen as a major problem. I am happy that India is actively taking part in environment related policies and reforms. The change in thought process is put forward by the fact that schools right from primary are focusing on environmental protection. My son who studies in junior KG had a summer project this year. The summer project included planting the seed and watching it grow. Isn’t that a lovely way to incorporate environment conservation habits in the children right from young age? Similarly my daughter has been a part of school efforts related to recycling paper, plastic and other material. I am hopeful that such initiatives will help in raising a much more aware and environmentally conscious generation than maybe our generation is. India as such is rich in natural resources. The fact that our ancient scriptures attributed a sense of godliness to these natural resources, we have an innate sense of respect towards them. We just need to channel this respect in the right way and instead of taking holy dips, or adding offerings, we should take it up as citizens to keep our holy rivers clean. We have been asked to pray to the sun, the moon, the trees, the rivers etc. So instead of just praying we should focus on conserving, cleaning and rejuvenating them. Glacier National Park in US was home to approx. 150 glaciers in 1910 but the number has shrunk to 52 in 2016. With the current pace of global average temperature rise, nearly 25 to 35 percent of animal and plant species face extinction. As of 2015, 4,630 square miles of reefs were destroyed, that is roughly 40% of world’s coral reefs. Global flooding could triple by 2030. We consumed all of Earth’s 2017 resources by Aug! 1. Visit a zoo and talk to the zoo keeper about extinct or endangered animals. 3. Visit a botanical garden and see the rare trees. 4. Go to a windmill farm and talk about alternate sources of energy. 6. Read stories related to plants and environment. 8. If you have a before/ after picture of your city show it to your children and ask their suggestions on how we can bring the city back to its former glory. 10. Instead of synthetic clay let your children play in some earth clay and let loose their creativity. It is time that as parents, we think about our coming generation and try to offer them a better planet. That will be the best gift that our generation can give. An environmentally conscious generation is the need of the hour. Let’s celebrate every day as World Environment Day. We must talk to our children and show them how an environment is important to us. We are alive today because of this greenery. The school takes its steps and we need to take it forward. Some of these are heartening while others (Cape Town, Antarctica) really make you wonder exactly how long the Earth will actually survive. It is important to take measures now instead of later. There may not be a later! Upbringing environment lover kids is very important. The points you mentioned can be a good start towards saving environment. 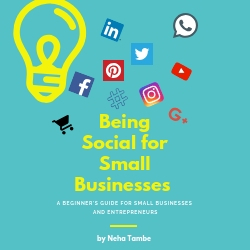 Good and timely post, Neha. Very sad about Cape Town because we have enjoyed it’s beauty for sometime while being there. I too agree we have to educate our kids regarding this. It’s really sad! I’m scared on what are w elevating behind for our kids ? Singapore is very good in this way! Wish we could learn from them. For singapore, I can definitely vouch for their amazing conservation efforts. It really gave me a good feel to know about satara and the conservation efforts at western ghats. Singapore and Satara I knew but Sirsi? Its a new name for me. Thanks for sharing. And also appreciating your kid for such initiative. Hope it was a fun time also.As a mother you are doing great job dear. A learning from you. There is so many things to learn from the cities who are trying to make a difference. More such initiatives will bring in so much positive change in helping to preserve our mother nature. The change has to be begin with small steps from all of us. It’s high time we help conserve our natural resources and save our earth for future generations. Each one of us should do our bit to do just that and include our children in going green. Thanks for sharing an informative post, Neha.